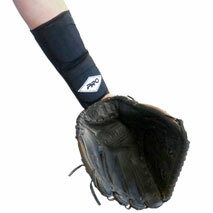 Revised design for additional longevity and durability, the PRO 771 protects an infielder’s arm when a ground ball takes an errant bounce. Using 1.5mm neoprene for the body along with a spandex panel it goes on quickly and off just as easily. Two separate pockets contain a dual density foam pad which couples a high density EVA foam with a slow rebound foam to maximize shock dispersion upon impact. Easy access to the foam pockets makes removal easy for simple cleaning. Available in black, Adult or Youth size. Fits right or left arm.